Kempu harive soppina or amaranth leaves palya recipe - Palya ( sabzi ) is an essential item in South Indian meal. Any vegetarian meal is incomplete without it. Palya is also known as randayi in Konkani. Amaranth leaves and dal palya is very popular, healthy and tasty. 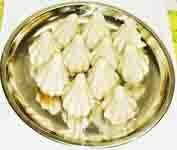 This is a perfect accompaniment for hot rice, pejje jevan (ganji oota) and even chapatis. I have explained here a very easy method of making palya using pressure cooker. Clean the amaranth leaves and chop off the hard stems. Wash and chop the leaves. Grate the coconut. Cut the onion into large pieces. Fry the coriander seeds and fenugreek seeds separately. Splutter the mustard seeds in little oil. Combine together all the ingredients mentioned under "grind to paste"
Put them in a mixer jar and grind it to a smooth paste using required water. Wash the toor dal thoroughly. Combine together the chopped amaranth leaves and dal. Add 2½ cups of water and put it in a pressure cooker. Take 3 - 4 whistles. When the pressure releases, pour the cooked dal and amaranth leaves mixture in a wide pan. Add the ground masala paste. Add salt. Mix well with a spoon. After mixing the ground masala, the gravy should not be too thin or too thick. It should be pouring consistency. Add water to get the desired consistency. Place the pan over a medium heat and bring it to boil. Simmer till you get the desired consistency. 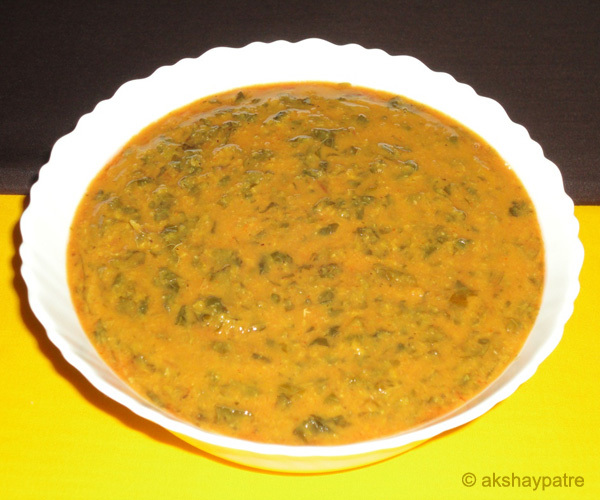 Serve amaranth leaves sabzi hot. 1. Clean the amaranth leaves and chop off the hard stems. 2. Wash and chop the leaves. 3. Grate the coconut. Cut the onion into large pieces. Fry the coriander seeds and fenugreek seeds separately. Splutter the mustard seeds in little oil. Combine together all the ingredients mentioned under "grind to paste"
4. Put them in a mixer jar and grind it to a smooth paste using required water. 5. Wash the toor dal thoroughly. Combine together the chopped amaranth leaves and dal. Add 2½ cups of water and put it in a pressure cooker. Take 3 - 4 whistles. When the pressure releases, pour the cooked dal and amaranth leaves mixture in a wide pan. 6. Add the ground masala paste. Add salt. Mix well with a spoon. After mixing the ground masala, the gravy should not be too thin or too thick. It should be pouring consistency. Add water to get the desired consistency. Place the pan over a medium heat and bring it to boil. Simmer till you get the desired consistency. 7. 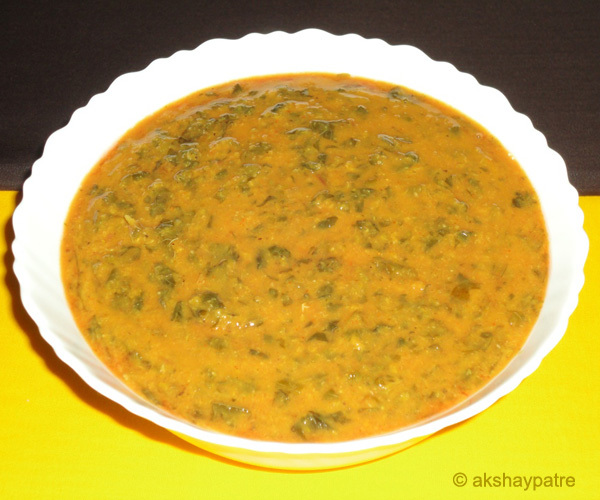 Serve amaranth leaves sabzi hot. Healthy and simple dish for dinner. Aren't we using tomatio/tamarind pulp in this recipe? Kavithaa, we don't use tomato or tamarind in this recipe. 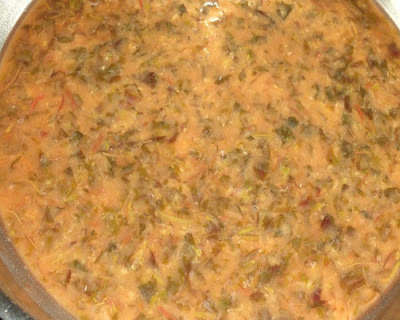 But, if you like some tangy taste, you can cook 1 or 2 tomatoes along with dal and amaranth leaves. Thanks for visiting my blog.